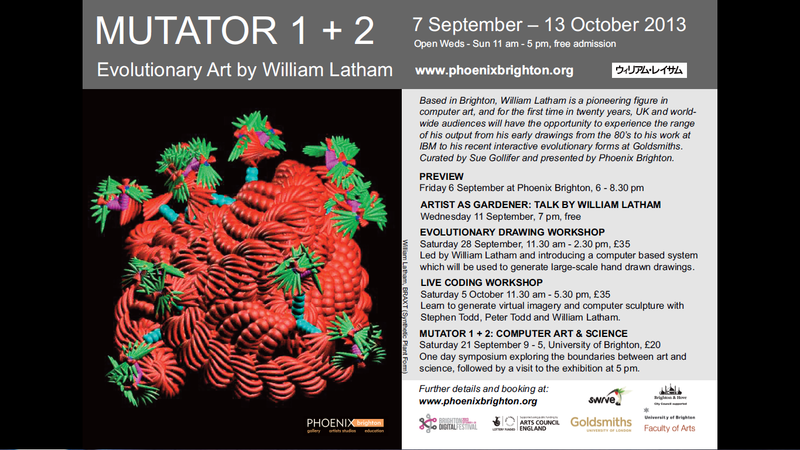 William Latham solo exhibition at The Phoenix Gallery, Brighton, 7 September- 13 October. Curated by Sue Gollifer and funded by The Arts Council England the exhibition forms the centrepiece of Brighton Digital Festival. It is the first major exhibition of Latham’s work in twenty years, and includes his early hand-drawn work, large-scale Cibachrome prints, video art and his most recent interactive projected imagery. Gollifer commissioned the artist to create a large-scale Retro-FormSynth, drawing directly on the gallery walls, as a focal point for the exhibition.